A new utility automates feature extraction from 3D CAD data. Marine propellers can last a long time – it is not uncommon to find a vessel running on its original set of propellers. Sometimes, these propellers even outlive the companies that produced them. For example, some large volume propeller manufacturers have permanently closed their doors and patterns, molds, and design data have been scattered to unknown corners of the globe. It’s fair to say that while the propeller manufacturing industry has seen growth, it has also seen consolidation. Today, many vessel owners, operators, and yards are faced with the challenge of replacing legacy propellers. The complex nature of a propeller’s helical surface can make this task very difficult. In fact, in many cases, the only solution is to create a 3D model of the propeller using a digital scanning device. This presents a few issues for manufacturing and production, as the 3D scan includes not only the geometry of the blade, but also any damage to the blade. It is very difficult to identify damage on a 3D laser scan without digging deeper into the foundation of the design. 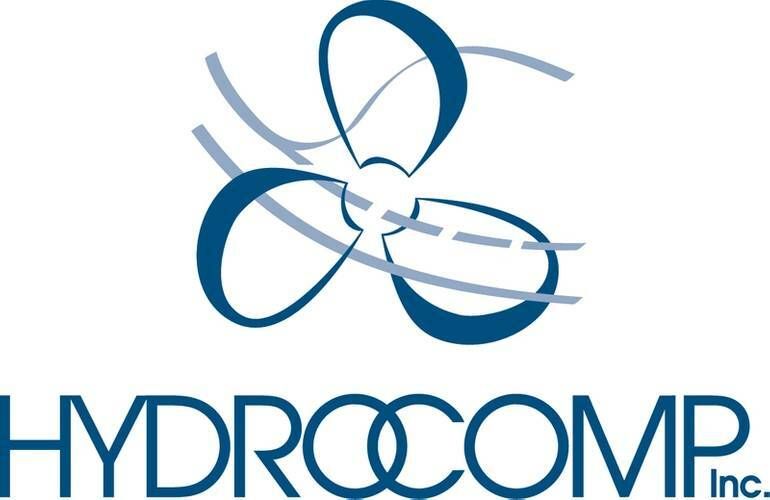 To identify and correct unintended damage in a 3D laser scan, HydroComp developed a new utility for propeller designers and manufacturers to extract, understand, and visualize the design data from a 3D CAD file. 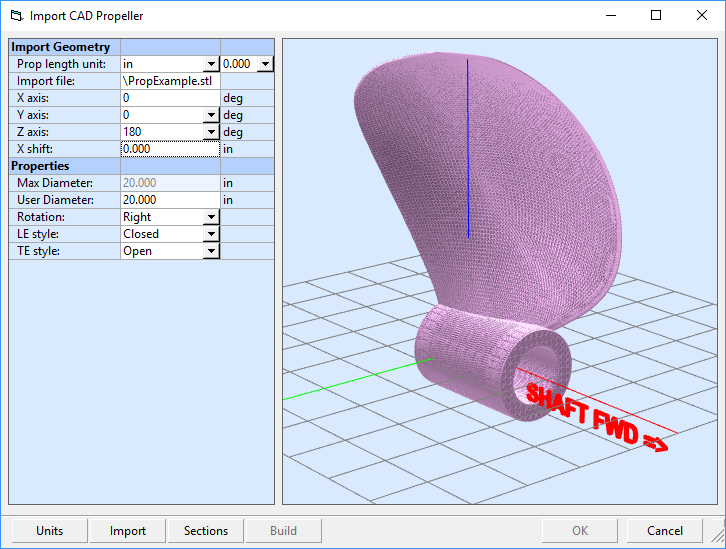 The Import CAD File utility in PropCad Premium 2018 drastically reduces the time and effort needed to recreate an existing propeller design or product model – a critical task for propeller manufacturers, designers, and inspectors. Previously, extracting design data from a physical propeller or a 3D scan of a propeller was a manual and cumbersome process. First, the diameter of the propeller would be measured. This allowed the inspector to mark an individual radius for taking measurements. Propellers were typically marked or scribed at multiple radii, then several measurements along the line would be taken to record the angle about the hub, the radius, and the axial drop to the propeller surface. In addition, the inspector had to take a measurement of the blade thickness at each of these locations. 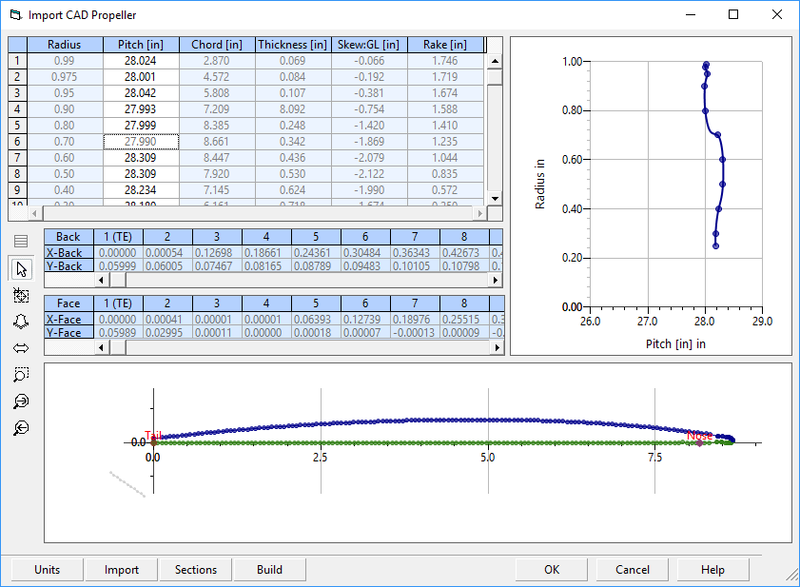 With this data, the propeller could be recreated and understood in terms of its parameters. However, this process took several hours to record the points and additional time to enter into a spreadsheet for calculating parameters such as pitch and chord length. The new Import CAD File utility allows propeller designers and inspectors to eliminate this entire process of manually laying out the measurement positions and recording the measurements. They will no longer even have to be entered using the Import CAD File process. This reduces the required time from several hours to just a few minutes to scan and import the model. Today, it is more affordable than ever to obtain a laser scan of virtually any part – propellers included. There are several commercial companies offering 3D scanning as a service for multiple industries. Scanners themselves have also become surprisingly affordable – some general-purpose scanners are more cost effective than specialized measurement devices such as digital pitchometers – which has led to an influx in 3D CAD files. In fact, these systems are so advanced that the detail and resolution available is stunning. The results are so dense that serial numbers, surface scratches, even regions with flaking coatings can be seen on these scans. It’s truly amazing, but more data (including geometric damage and surface blemishes) is not always helpful when recreating a propeller. 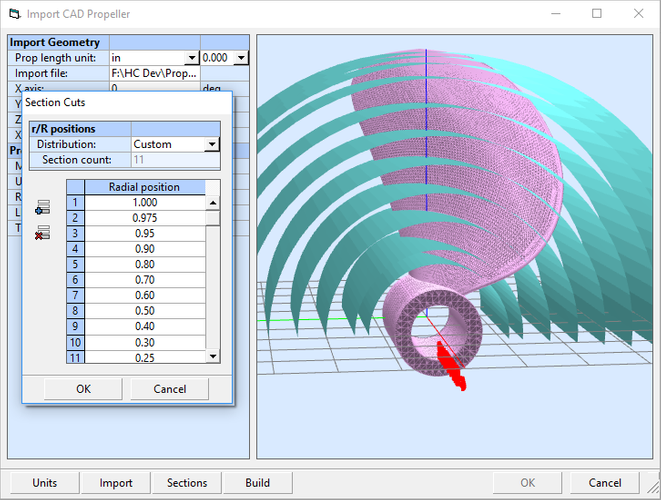 PropCad’s new Import CAD File utility helps to reduce this data into a manageable and understandable format. Take a look at an example to demonstrate how a 220MB laser scan can be reduced to the design data. First, we launch the Import CAD File utility from PropCad Premium 2018. The user selects a CAD file in either STL or OBJ formats. The CAD models require the shaft axis to be positioned at the origin, but there are tools in the utility to rotate and translate the CAD data into the proper position with the integrated 3D preview window. Once the CAD model is oriented, the user can specify which radial positions (i.e., the 50%, 60%, etc) are extracted from the 3D CAD file. Several presets are included to automate this process, but the user can always add and remove positions as needed. The positions are previewed as cylinder cuts so that the user can get as close to the hub or tip as desired. With the radial positions selected, the 3D intersections can be calculated. PropCad's mathematics unwrap these 3D cylindrical sections so their position and orientation can be quantified. The resulting 2D section shapes and the associated parameters for chord length, thickness, pitch, rake, and skew are calculated from the intersections. The extract parameters are displayed for the user to review. Any of the columns can be plotted and visually checked for smoothness and correlation to the expected values. In the above example, it can be seen that this propeller, which should be constant pitch, has some damage from the 70% out to the tip, which has reduced the pitch in this region. The user has an opportunity to review the derived distributions within the utility. Once the parameters and sections have been extracted and reviewed, the user can send the data to PropCad for further review and manipulation. Within the main PropCad interface, the user can adjust the blades parameters and export a correct and truly smooth 3D model. In this case, it is very easy to smooth the distribution of pitch from the 70% radius to the tip. The user can enter the desired value into the Blade Distribution table at the bottom to correct the orientation of the section. The result is a propeller that is true to the original, but with significantly smoother, damage-free surfaces. 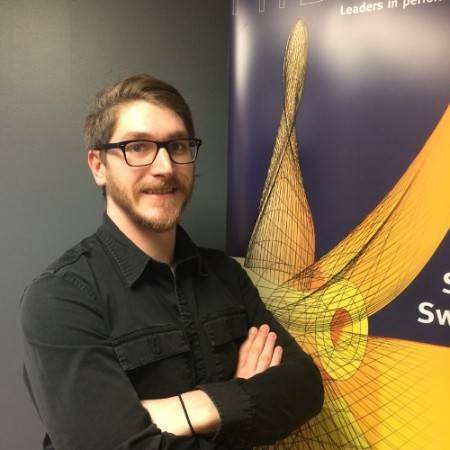 Senior Project Engineer, Adam Kaplan, is the lead developer of PropExpert and PropCad, HydroComp's propeller sizing and propeller design for tools. He has been with HydroComp for over a decade and is a frequent speaker at conferences. He holds a Master’s of Science in Mechanical Engineering from the University of New Hampshire and is the regional membership chair of the Society of Naval Architects and Marine Engineers (SNAME) for New England. This article first appeared in the November print edition MarineNews magazine.